Conference of Presidents, Union of Orthodox Jewish Congregations praise Senate committee for passing law cutting funding to the PA.
Jewish groups in the United States on Thursday welcomed the passing of the Taylor Force Act, which would cut U.S. funding to the Palestinian Authority (PA) until it stops payments to terrorists and their families. The Senate Foreign Relations Committee passed the legislation by a 17 to 4 vote. It was supported by all of the Republican members of the committee and six of the Democrats. 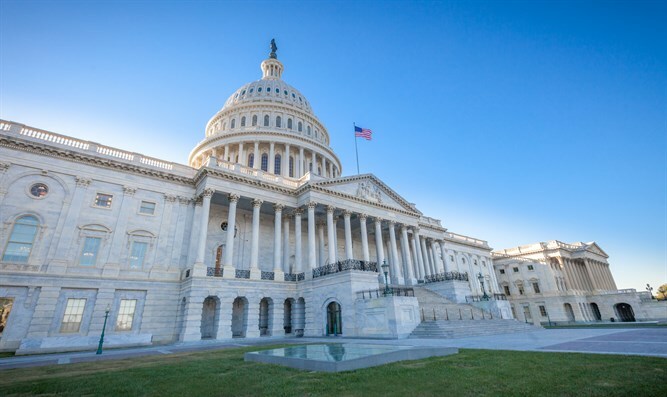 Leaders of the Conference of Presidents urged the full Senate to quickly pass the Taylor Force Act following its bipartisan approval at the Senate Foreign Relations Committee. “We urge the Senate to promptly adopt this important legislation,” they added. The Union of Orthodox Jewish Congregations of America, the nation’s largest Orthodox Jewish umbrella organization, also applauded the Senate Foreign Relations Committee . “This strong bipartisan vote by the Senate Foreign Relations Committee today moves toward ensuring that the U.S. will not tolerate – or pay for – violence and terrorism against Israelis, Americans and others,” said OU Advocacy Center Executive Director Nathan Diament. “This bill is long overdue and we thank Chairman Corker, Ranking Member Cardin and the committee for taking this significant step toward thwarting Palestinian terrorism. We also thank the bill’s sponsor, Sen. Lindsey Graham, for his passionate and steadfast leadership on this issue,” he added. Earlier this week, the Foreign Relations Committee modified the legislation, adding provisions that would make it significantly harder for the PA to continue receiving its annual $300 million from the United States in aid money while it continues to pay terrorists and their families. During a recent meeting between President Donald Trump and Abbas in Washington, the president brought up the issue of the PA’s paying salaries to terrorists and their families. Secretary of State Rex Tillerson recently claimed that the PA had stopped its policy of paying terrorists following pressure from the Trump administration, but a senior Israeli official later said there was no evidence the PA had taken any steps to change its policy.